With rising summer temperatures the fire danger level went from "high'' to "very high'' in the Angeles National Forest on the weekend following the Fourth of July holiday. The change in alert status comes as vegetation continues to dry out due to extreme summer heat. 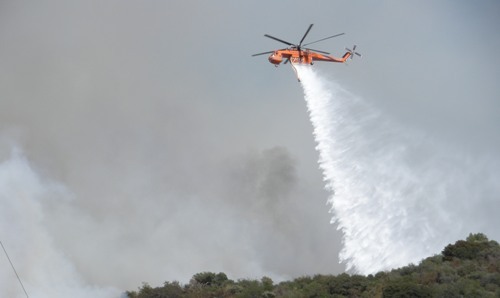 Summer recreational activities that bring more than a million visitors a year to the Angeles National Forest are factored into the fire danger level because the majority of all wildfires in the forest are caused by humans. Currently, open wood and charcoal fires will only be allowed in developed campgrounds and picnic areas where fire rings and grills are provided. Gas and propane-powered stoves and grills are permitted in backcountry areas with a valid California Campfire Permit, which is available free of charge at all U.S. Forest Service offices and most visitor centers and fire stations. And just a reminder, all fireworks are prohibited on national forest lands. Forest visitors are "urged to use common sense'' and to maintain a higher level of awareness with the increased fire risk. Hiking/Camping is a fun way to get family and friends together to enjoy the outdoors and to get some physical activity. However, you should always be prepared for the unexpected. You should tell family and friends what your plans are and provide a list of who will be going with you. That's why the Los Angeles County Sheriff's Department would like to remind the residents of Los Angeles County that having a hiking / camping plan is crucial to survival in case of an emergency. The Montrose Search and Rescue Team personnel are reserve sheriff's deputies who volunteer their time to help others for $1 a year, and who partner with sheriff's civilian volunteers who volunteer for free. There are over 150 members of the eight Search and Rescue teams of the Los Angeles County Sheriff's Department, who were activated for over 450 search and rescue missions last year, making it one of the most active counties for search and rescue missions in the nation. Reserve deputies and civilian volunteers are supervised by full-time sheriff's deputies. To receive more detailed, up-to-date information directly from the Los Angeles County Sheriff's Department (LASD) via e-mail, register for "Nixle" alerts at www.Nixle.com or more directly at https://local.nixle.com/register/ and register for "LASD Headquarters Newsroom (SHB), Los Angeles County Sheriff" and your local LASD station area. Or, text your zip code to 888777 to receive text alerts only. Standard text messaging rates may apply depending on your calling plan.